Hey players! Do you like collecting various types of Norrathian… like Far Seas Ferrin? Well, then you’re in luck because until11:59PM PST on Sunday, March 1, 2015 you’ll earn DOUBLE alternative currency. Note: This is in addition to the bonuses to alternative currency that All Access members get every day when they play EverQuest 2. That means that All Access members will get double DOUBLE tokens during this promotion. 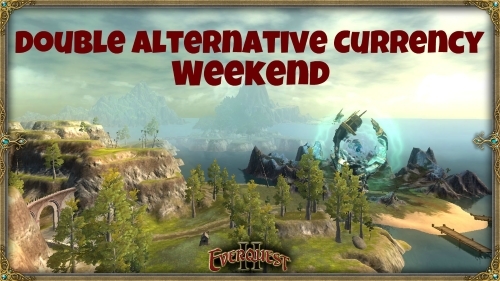 This is a great opportunity to stock up on [eq2u]Far Seas Ferrin[/eq2u] or any other alternative currency you’ve been collecting in-game. We’re excited to offer this to our players, and we’ll see you in-game this weekend! Technically it’s 3x the orginal for gold. So if you normally get 3 you get 9, not 12 (3x2x2). Okay, so it’s 9 extra. My mistake I apparently missed the original award of 3. A quest that awards say 3 ferrin is doubled for subscribers to 6. Then that 6 is doubled again this weekend. So subscribers get 12 total. F2P would only get the 3 and have it doubled to 6. Um… I was told there’d be no math?